Dana Wildsmith will read at City Lights in Sylva, NC from her new collection of poetry, One Light this Saturday, February 23 with Susan O'Dell Underwood, author of The Book of Awe. 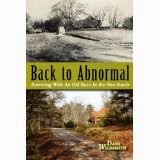 Wildsmith is author of a novel, Jumping, and an environmental memoir, Back to Abnormal: Surviving With An Old Farm in the New South, which was a finalist for Georgia Author of the Year. She is also the author of five collections of poetry. She has served as Artist-in-Residence for Grand Canyon National Park and for Everglades National Park. She lives with her family on an old farm in north Georgia and works as an English literacy instructor at Lanier Technical College. Anyone who lives near enough to attend will enjoy these two poets. Dana often teaches at John C. Campbell Folk School. Visit her website here to learn more about her. 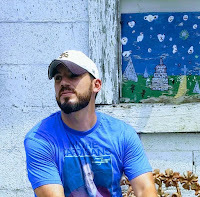 "Dana Wildsmith, highly published author and poet, took a few minutes out of her busy schedule to answer some questions for me and I want to share them with you. Glenda: I notice that you have enjoyed the friendship of some great literary men including Terry Kay and the late poet, Jim Wayne Miller. Fred Chappell wrote the introduction to Back to Abnormal. How did these friendships develop and how have they affected your writing life and personal life? Dana: Well, I’m friends with women writers, too, of course, and just as with the men, I’ve met them through writer events: workshops, conferences, and the like. I’ve found that one of the wonderful perks to becoming engaged in the practice of writing is the way it gains you entry in a new community, the community of writers. In the South, that community tends to be unfailingly inclusive and generous, so when I asked Fred if he’d write an intro for Back to Abnormal (it being every book-writers’ goal to splash known and attention-getting names across your book), he said, “Why sure, darlin’.” Fred is also my number one pen pal. We’ve exchanged letters twice a month or so for twenty years. Letter writing, by the way, I would recommend as possibly the very best writing exercise. Terry Kay lives just down the road from me so we see each other often. I admire his writing boundlessly and recommend To Dance with the White Dog as a book everyone should read, especially every southerner. And Jim Wayne was my writing mentor, if I have one. He sought me out, writing a letter to me about some of my poems and encouraging my writing in very specific ways. There is no way I could ever repay the debt I owe him, but keeping his name alive through references to him in my own writing is the one way I have of trying. Glenda: I love that you write so much about your dogs. Max and Fred were subjects of a poem that you said most non-writers really like. It is one of the first of your poems that I fell in love with. Can you tell us about that poem and why it is so well liked? Dana: My poem “Peopling” always makes people laugh because it first surprises them and then they think to themselves, Yes, that’s so true. Those two reactions back-to-back are the heart of humor. And all of us need more satisfying humor in our lives. Glenda: Your ESL (English as a second language) students call you Teacher instead of calling you by name. You were not pleased, at first, but tell us what you learned that made you feel much better about being called Teacher. 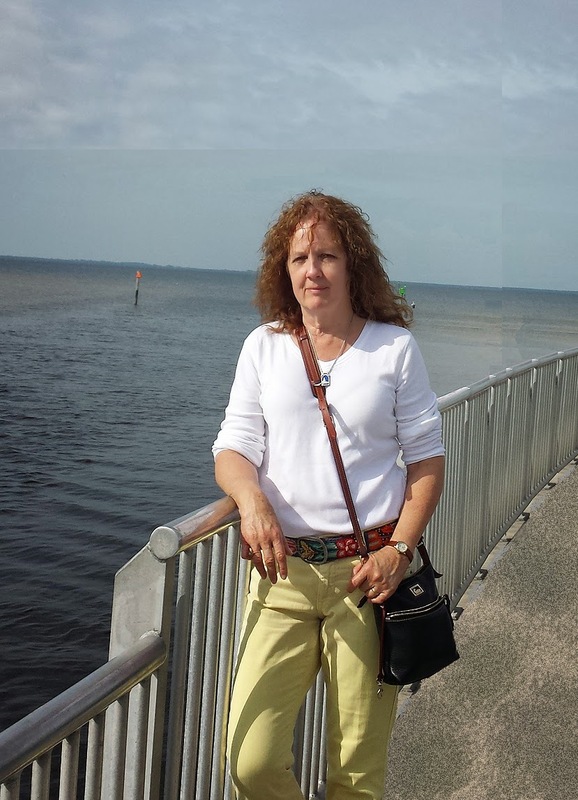 Dana: As I have written in Back to Abnormal, I at first found it a little off-putting when my ESL students called me Teacher because it sounded so formal and distant. Then I discovered that in just about every part of the globe except the US, to call someone Teacher is the highest honorific. Now I love it. I have come to realize, also, that my experience with coming to an understanding of the depths of meaning contained in that title, could stand as example of the depths of meaning that should be written into our stories and poems. To learn how to get to the root of our world knowledge is perhaps the primary key to producing writing that will resonate with a large audience. Thanks for your time, Dana. 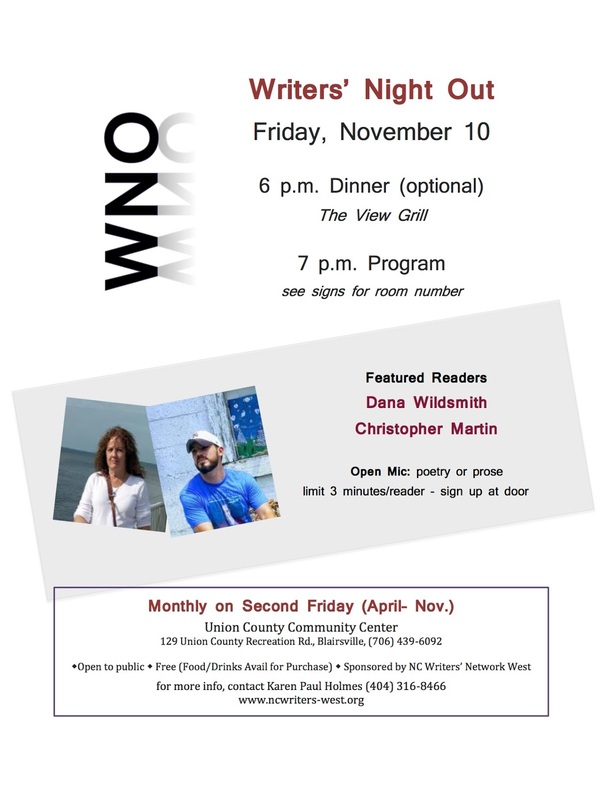 We look forward to your coming to our area to teach at Writers Circle and to read at Writers Night Out." For details of Dana's class at Writers Circle, click here. All we have to work with when we set out down fiction's road is the stuff of our lives, but that's enough. Every one of us has a couple of horror-story-worthy relatives, and we've all lived through years of high drama in our lives. The material is there, for sure, but the rub lies in figuring out how to use that material when memoir is not our aim. In this class, we'll talk about ways to use those three crazy uncles of yours to flesh out one strong character for a story or novel, how to conduct and make use of interviews, and a little about scene-writing. This will be a class for all levels of fiction writers. Dana Wildsmith's environmental memoir, Back to Abnormal: Surviving With An Old Farm in the New South, was Finalist for Georgia Author of the Year. She is the author of five collections of poetry, including most recently, Christmas in Bethlehem. Wildsmith has served as Artist-in-Residence for Grand Canyon National Park, as Writer-in-Residence for the Island Institute in Sitka, Alaska, and she is a Fellow of the Hambidge Center for Creative Arts and Sciences. Tonight on Facebook, I learned that Dana Wildsmith has been chosen for the 2009-2010 Artist-in-Residence Programs for the National Parks. She will be at the Grand Canyon National Park. Below is an interview I did with Dana a couple of years ago. I thought our new members and readers might like to read it. Dana Wildsmith is a fine poet, writer and teacher. Recently I discovered Dana's poetry on Jayne Jaudon Ferrer's Poetry Parade and commented with enthusiasm about my appreciation of this poet's work. I was delighted to have Dana respond to me with a thank you email. From there we have become email friends, and I'm delighted she agreed to take time to give me an interview for this site. You can find her books listed on her website, http://www.danawildsmith.com/. Glenda: Dana, you grew up living in different places because you are a preacher's kid. How did that affect your writing? Dana: I loved being a PK, and moving around. I loved moving to a new place and having everyone already know who I was and why I was there. Even as a small child I got excited about the possibility inherent to moving- that idea of starting over (as if a seven-year-old has anything to start over from!). I think the moving made me more aware of my surroundings and more attentive to differences. I became a person who notices by habit, and that is a good trait for a poet. Glenda: Where did you live the longest as a child? Where was your favorite place to live? Dana: I didn't live anywhere the longest. My daddy was transferred every five years, so my inner time clock still starts thinking about moving on after four and a half years. MY favorite place while I was growing up was definitely Savannah. I loved Savannah from the first time I saw it. I loved being part of all that history and I loved the somewhat self-centered air of assurance Savannahians have from birth. My mother says I was born secure, so I guess I felt at home with the sense of assurance of place and role among the old families of Savannah. And, of course, I loved the beauty of the place. Glenda: Did you always know you wanted to be a writer or poet? When did you begin to realize you actually are a writer? Dana: I don't know if I always wanted to be a writer, though I have always written. To me, words and playing words was always tied in with music. I am a singer and need music in my life at all times. When did I realize that I am a writer? The flip answer would be to say- the first time someone gave me money for words I had written. That's partly true, though. I consciously think of myself as a writer whenever someone else thinks of me in that way. Otherwise, I think of myself as writing, which is a whole other attitude. Glenda: I have come to believe that many writers are insecure about their work until someone they respect validates them by telling them they are indeed a writer or a poet. What do you think about that? Dana: I think there's a lot of truth to that. But I also think it's not limited just to writing, Any time we are investing huge amounts of time and energy into something that doesn't (at least at first) come with a paycheck as validate, we need some other form of validation that we aren't being foolish or wasting our time- and the validation which seems to hold the most weight is affirmation from someone more established in the art. Glenda: You and your husband are now living on a family farm outside Atlanta and you are feeling the impact of developers buying up properties and making subdivisions all around you. We face that here in the mountains and feel helpless to stop this destruction of mountain tops. What are you and your husband doing to make a difference? Dana: We are doing the same things my friends involved in the fight against Mountain Top Removal are doing- we're fighting. We don't give in to any changes which are needlessly harmful without questioning, and then- if need be- starting the process of taking any possible civic or legal action to stop the harm. We are attentive, constantly, to what's going on around us. We don't let anyone get away with anything. Glenda: When did you publish your first poem and where? Dana: I truly don't remember. But I know that one of my very first acceptances was from Yankee magazine- a commercial journal whose poetry editor I greatly admired. Glenda: What advice do you have for beginning writers or those who have been writing a long time, but have trouble getting published? Is it really all about "who you know"? Dana: It helps to know people, but the happy secret is that the more you plod along, sending things out and getting rejections, the more you get to know people- and they, you. All you can do is keep on keeping on. And commiserate with other strugglers. I remember going to a writing festival and running into the quiet successful poet Michael Chitwood, who told me he'd just started having a few things accepted after a year of rejections. He had no idea how much this cheered and heartened me! Glenda: Why do you think so many writers and poets are self-publishing now? - Because it is so possible now. It's relatively easy to turn out as fine or nearly as fine a product as many publishing houses do. - and because the book market is so tough right now that this may be their only way to get published without a long wait. Glenda: What place do you think the Internet has in the future of publishing? Do you have a website or a blog? I think it is firmly established to the extent that any writer who wants to keep on seriously being published and in the public eye needs to keep this medium in mind. 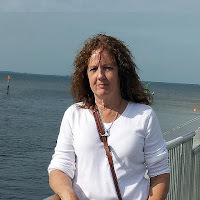 I have a web site: http://www.danawildsmith.com/ It has proved invaluable to me, and has put me in touch with people who otherwise would have had a tough time finding me. Glenda: I know you are on faculty for the John C. Campbell Folk School. What do you most enjoy about teaching there? When is your next class at JCCFS? Dana: What I love most about teaching there (besides the food- seriously!) is the space of time I have to get to know my students and their work. We have all day, for five days, with each other. It's a great luxury which affords us the chance to make leaps forward in our writing. My next class there will begin on Sunday, August 17th and go through that week. It's entitled:Beyond Memoir. In this class (which will be fine for writers of all levels of experience), we'll work on taking the facts of our lives and using them to create writing which moves beyond the mere recording of facts, into a larger purpose. Glenda Beall writes, teaches and manages this blog from Hayesville, NC.